Diego Costa (£10.3m) dominated the Fantasy Premier League bonus points as his two goals helped steer Chelsea to a 4-2 victory over Southampton. The Chelsea striker also laid on the assist for Eden Hazard's (£10.4m) opener to score 66 in the Bonus Points System (BPS) - Costa's best total of the season and the highest in Gameweek 34 so far. Hazard ranked next in the BPS, tallying 36 to claim two bonus points. The Belgian scored a fourth goal in as many Gameweeks and completed 83% of 54 passes, along with two dribbles. Need inspiration for your second #FPL Wildcard? Southampton's Oriol Romeu (£4.4m) picked up the remaining additional point, with 30 in the BPS. The Spaniard scored for the first time this term, contributed 11 recoveries and completed 88% of 76 passes - more than any other player in Tuesday's contest. Costa's ICT Index score of 25.0 is ranked top for Gameweek 34 and is the striker's best tally of 2016/17. It was built around a Threat score of 115, with the striker enjoying 16 touches in the opposition box - more than any other Chelsea player in a single match this season. That translated into six shots on goal, all from inside the box, with three finding the target. Hazard was again the chief architect for the league leaders. He totalled 68 for Creativity, having made 35 passes into the final third - more than any other player - creating five scoring chances. Sold by more than 136,000 FPL managers prior to Gameweek 34 - second only to Manchester United'sZlatan Ibrahimovic (£11.4m) - Costa bounced back into form in dramatic fashion. A 16-point tally was his biggest season haul, while a first brace at Stamford Bridge marked only the second time he has scored more than one goal this term. Since Gameweek 27, Costa had lost 340,000+ owners following a run of just two goals in 10 starts, but he is now set for a revival. More than 8,000 FPL managers have moved to acquire his services, making Costa the most-signed player over the last 24 hours. Hazard's stock continues on its steep ascent. He has produced five goals from his last six Gameweeks, scoring 50 points to move just eight shy of Arsenal'sAlexis Sanchez (£11.5m) as the top-scoring FPL player. In defence, Chelsea conceded for the eleventh successive Gameweek. But Gary Cahill (£6.6m) and Marcos Alonso (£6.8m) strengthened their positions as the two top-scoring FPL defenders with a goal and assist respectively. Alonso has scored or assisted 10 goals this season, joint-top for FPL defenders with Everton'sSeamus Coleman (£5.7m). 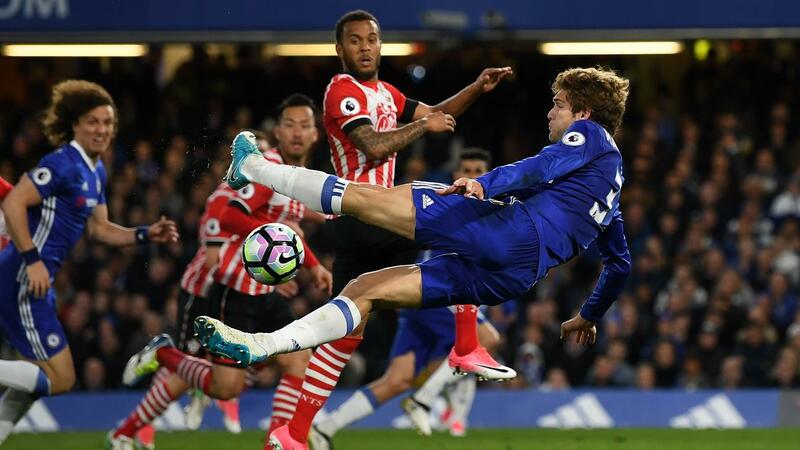 For Southampton, striker Manolo Gabbiadini (£6.4m) produced his first returns since Gameweek 27 with the assist for Romeu's effort. Second only to Costa for transfers in over the last 24 hours, the Italian remains a top target ahead of Southampton's two Double Gameweeks. Ryan Bertrand (£5.5m) is another Saint to monitor. Netting his side’s second, the left-back has offered a steady stream of attacking and defensive points in recent outings. He has recorded a goal, four assists and four clean sheets in his last 10 Gameweek appearances.